ARP High Performance Series Rocker Arm Studs..Rocker Arm Studs, ARP Pro Series Rocker Arm Studs,7/ 16-20 in. Thread, 2.10 in. Ef Comp Cams Rocker Arm Studs, 3/ 8-24 in. Thread, 1.75 in. Comp Cams Rocker Arm Studs,3/ 8-24 in. Thread, 1.52 in. E Crane Rocker Arm Studs Crane Rocker Arm Studs 3/8-24 in. Thread, 1.68 in. Crane Rocker Arm Studs 3/8-24 in. Thread, 1.68 in. Base Thread Size: 7/16-14 in. 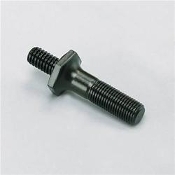 Rocker Arm Nut Thread Size: 3/8-24 in.